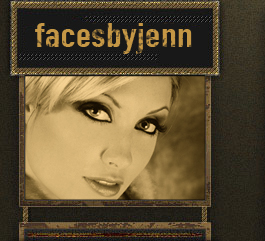 Welcome to Faces by Jenn! Résumé, Testimonials, Credentials, and Experience. I have been doing makeup for Fashion Photography, Photography Workshops, and television since 2006. I have been in the printing and design industry since 1993, with a Bachelor of Fine Arts degree in Computer Graphics from the Atlanta College of Art. Making things appealing to others is my expertise, whether it is logos, brochures, packaging, or websites. In 2006, I decided to broaden my horizons and begin applying my natural ability with color to the face. After these years of practice at photo shoots, workshops, television spots, weddings, proms, and special occasions, creating beauty has truly become my passion. Also, keep in mind, with my print and design background, I've been working in Photoshop in since 1992, so if you need retouching or get stumped on achieving a desired effect, feel free to ask!